The Army Medal, from same die as Navy Medal, differed only in the bail, an eagle perched on crossed cannon. In 1863, Secretary of War Edwin Stanton presented the first Medals to six surviving members of Andrew's Raiders. 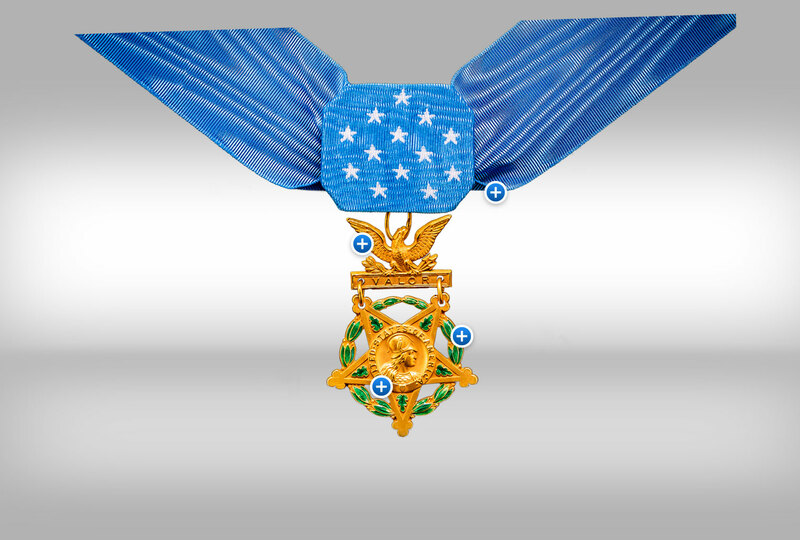 In 1904, recipient Gen. George Gillespie redesigned the Medal. The ribbon was changed from its red, white and blue to a light blue with 13 embroidered stars for the 13 original states. The reverse of the new Medal is blank, but the words, "The Congress To,” appear on the back of the "VALOR" bar, and the recipient's name is filled in below. The 1862 version of the bail was an eagle, symbol of the United States, perched on crossed cannons and clutching a saber. The eagle now clutches shafts of arrows and perches on a bar bearing the word "VALOR." The oak clusters, representing strength, remain in the points of the star but are now rendered in dark green enamel. The laurel clusters (for victory) form an open wreath, also enameled in green. In the “Gillespie Medal,” the words "United States of America" replaced the 34 stars (representing the number of states at the time of the Civil War). The scene of "Minerva Repelling Discord," so appropriate during that time of disunion, is now a simple profile of the helmeted Goddess of War, still with an owl on her helmet, representing wisdom.